The Wellington haul gifted me a number of vintage computers most of which you see below. I've slowly been working through them and have got to the one shown by the big red arrow. 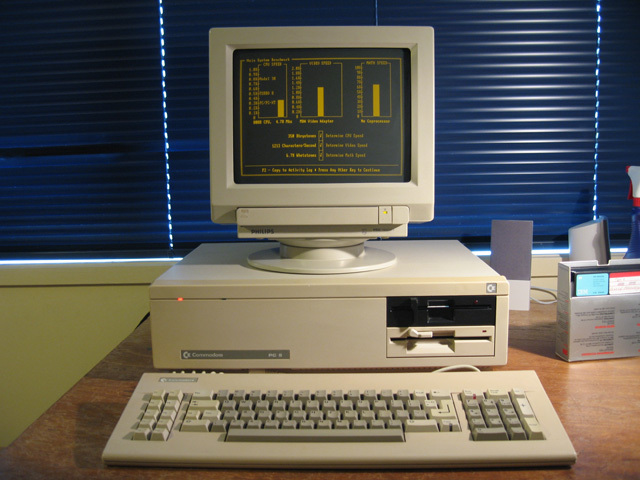 The Commodore PC-5. No fixes were needed to this machine. That means this blog article is essentially my impressions of the model but as it needed a good clean, I feel justified in squeezing it into the restoration section of the website. A rare or unpopular model? 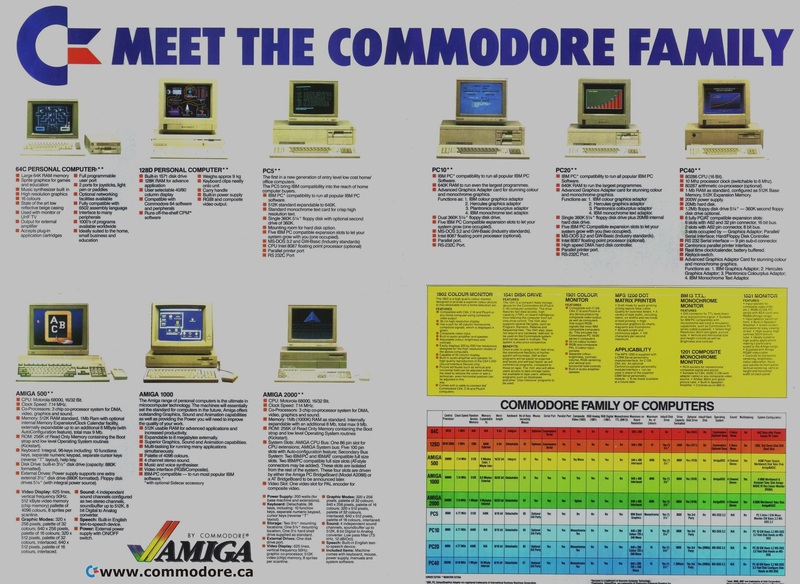 This Commodore PC model is hardly mentioned on the Web. I'm not sure why? It could have been sold in small numbers and was quickly superceded by the PC-10. Alternatively, perhaps it was a poor seller? Maybe it was just distributed in Australia or New Zealand so wasn't well known? At the time of writing a Wikipedia entry on Commodore PC-compatibles refers to it as being the same as the very limited PC-1. This is incorrect. The computer is a full sized PC compatible with 5 expansion slots and two 360k floppy disk drives. (Update: this wikipedia article has now been corrected). My machine came with the bare essentials. Just one card for combined monochrome graphics and printer. There is also a small vertical board coming off the motherboard. It's the one with the blue capacitors in the image above. I'm not sure what this does. Maybe it holds the memory? 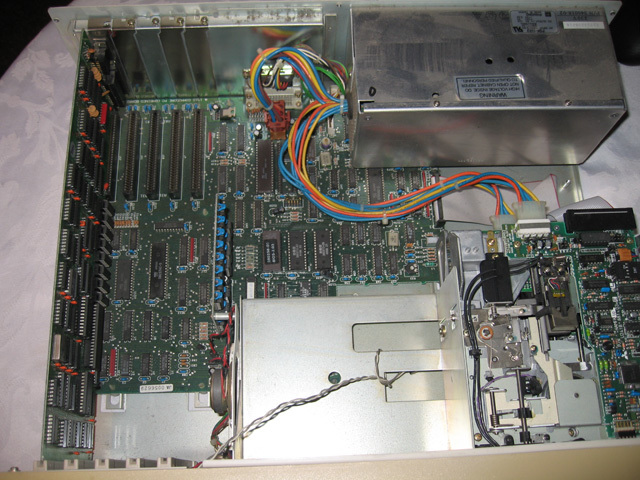 Another motherboard fitting is a serial and a parallel port with the sockets wired in at the back. 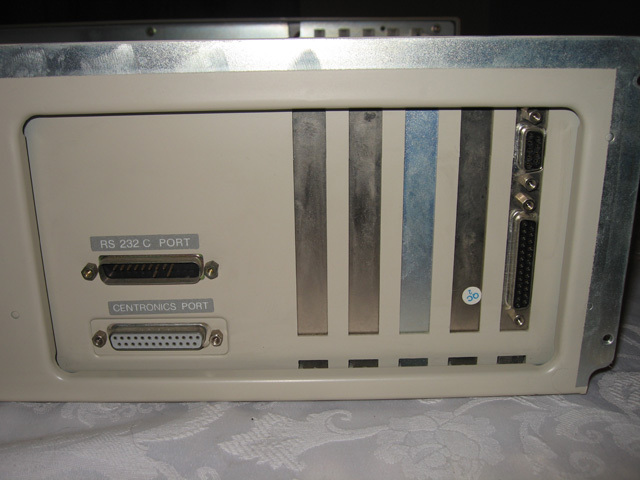 In the original IBM PC, these ports would have been on separate cards hence taken up slots. It shows these interfaces were no longer regarded as optional extras in a PC by the time this model was released in 1984. 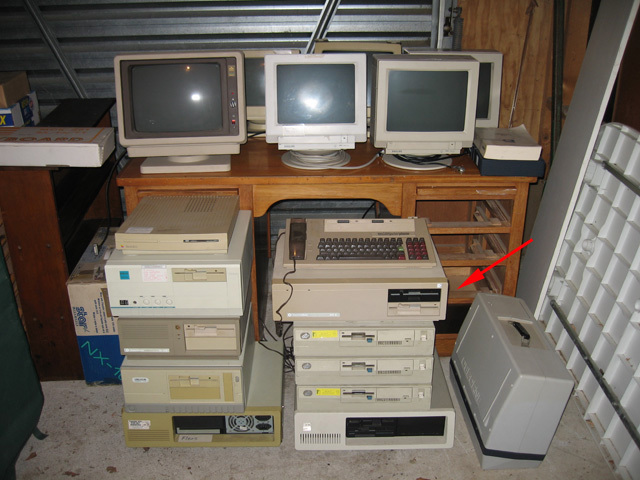 The computer sported one cream coloured floppy disk drive and one black one. The latter was an optional extra. In the stock model (seen in this brochure) a single cream coloured drive was proudly displayed at the front. Checking out the system showed 640k memory on board and a processor running at about 4.7 MHz. This is the same speed as the original IBM PC/XT. 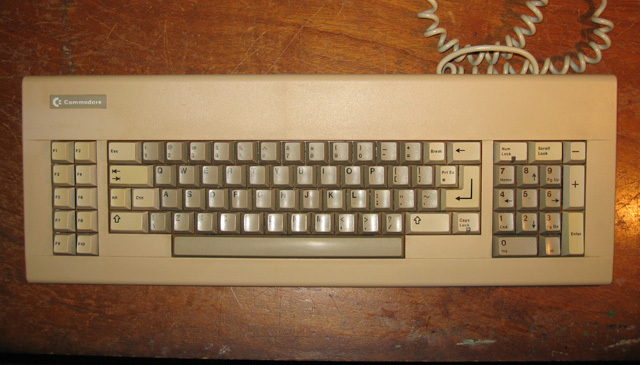 The keyboard was similar to the XT design, with the function keys down the left hand side and the cursor keys shared with the keypad. It not quite the same though with Alt and Ctrl BOTH being above the shift key and a few other differences. One neat feature as regards the keyboard is how it's plugged in. Rather than at the back as with most PC clones, its plug is recessed under the front panel. This makes for easy assembly. Apart from having a built-in serial and parallel port (hence freeing up at least one slot), this model doesn't offer much more than the original IBM PC. I like the style though. Some would consider the beige square box boring. Not me. I'm a minimalist at heart and I find the clean lines, lack of decoration and simple style and colour attractive. It's not a classic machine and I really don't have room for it amongst the collection. I won't list it there. I'll let it enjoy it's place in the sun for a while though before I decide its fate. Update: 3rd December, 2013. Ok, I've become quite fond of it. It's now an official collection piece.